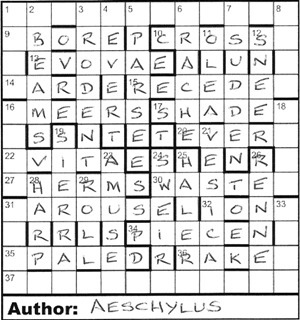 One of the stalwarts of the crossword world this week, and it was almost certain that we were in for an entertaining puzzle. We were greeted by misprints and extra wordplay letters (30 in total), missing wordplay letters (three), and a clash (one). The misprint corrections were to be converted to numbers helping to draw eleven straight lines in the grid. 1ac was SEISM. Thanks, Samuel… off to a quick start. I switched to the downs. 1dn Tiddler’s sister wearing silk? Quite the opposite (7) wasn’t as obvious, especially as I assumed the corrected misprint would be ‘Toddler’. Luckily, 2dn EOAN, 3 IMP and 4 SPRIG were easier. 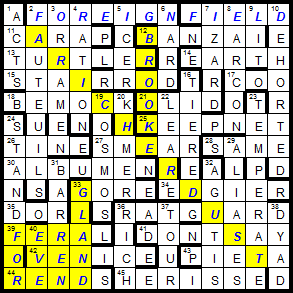 I decided to carry on with the down clues, since 4ac New trainer’s allowed in flying post (9, two words) eluded me. 5 ASPER, 8 ELTS and 9 TIE didn’t though, and returning to 4ac, I could now see AIR LETTER. My solving went fairly smoothly with only one slight mistake on the way. For 33dn In Miami, agent cracking down on supply of slow cargo transport rolled up first (4), which was obviously NARC, I had the corrected misprint as ‘snow’ (cocaine, morphine or heroin) as opposed to ‘blow’ (cannabis in British slang or cocaine in the US). That would have meant that my final line segment would have gone hurtling towards and off the left edge of the grid. Eventually, all the directions given by the extra letters in the wordplay (N, SE, NE, etc) and values given by the misprint corrections, enabled a large MAP to be spelt out, starting with the O of OORT or the A of SAWED. I was in the first camp. Although I toyed with Treasure Hunt for some time (also 12 letters, but we’d have been told it was two words), ORIENTEERING wasn’t too far behind. This was confirmed by using the O of OORT, rather than the A of SAWED, which became SOWED; the other way round would have presented AORT as a non-word. 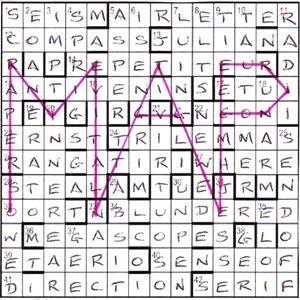 So, having used the O, I was still baffled as to how the rest of the word was spelt out in the grid. Since I was going to be away in France for the weekend before this blog appeared, I decided to get a head start on the animation above. It was only then that I saw the letters that my line segments passed through and all became clear. Excellent. My favourite clues this week were 25dn Without strip? Order to leave the pitch (7, two words) for SEND OFF (SEN DOFF), and 35dn 1970s band win in, missing the end of Alan Wells’ perfect race? (4) for ELOI. Oh yes, and 21dn Expert team could produce autoerotism with this (8) for VIRTUOSO (V missing from wordplay)! 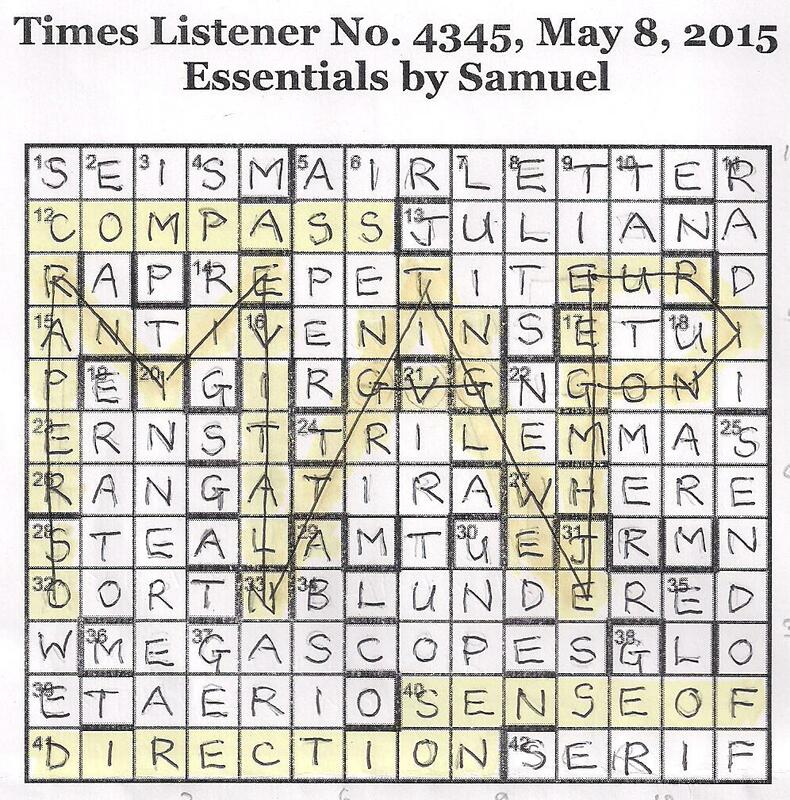 Thanks, Samuel, As hoped, an entertaining and enjoyable puzzle. Then comes that preamble and the other Numpty starts growling as we read that there are either misprints or extra letters in 30 of the clues AND a clash AND three clues where the wordplay indicates the answer with one letter omitted. What’s more, we are going to have to perform some alphanumeric conversion AND draw twelve straight lines on our completed grid AND make a guess at three unclued lights. There is enough there to suggest that we might have a long night’s solve ahead of us. Time to fix a stiff drink and do a quick check that Samuel still qualifies for the Listener Setters’ Tipsy Gang; a speedy run through the clues and I am two-thirds of the way down, finding medicine, a donut, cake, a cheap cigarette, trout and an olive, before he produces the Italian vermouth and confirms that he has retained his membership. ‘Olive left after Vice Admiral drinks Italian vermouth (5)’ [VA round IT + L giving VITAL and one of those misprints – this must be Alive]. A generous clue and, fortunately there were many like that, and since we were performing the alphanumeric conversions as we went along, a pattern was speedily emerging. N, S, E and W were appearing, interspersed with numbers which were clearly going to tell us how many cells to move in any given direction. We paused to enjoy one of my favourite clues of the year, ‘Leaders of Ancient Britons stay in and look after puss for a night (5)’ [AB + SIT with pUss becoming pAss] then we examine our set of directions. 6N, 2SE, 2NE, 6S, 6NNE, 6SSE, 6N, 2E, 1SE, 1SW, 2W. We have already almost filled our grid and discovered that we need a COMPASS and a SENSE OF DIRECTION so it doesn’t take much geometry or cartography (please tell me what the correct word is, some kind soul) to tell us that this would spell MAP and that we are ORIENTEERING. We had one clue left to solve (well, no, two actually, as Wells’ perfect race was still escaping us, though we had encountered ELOI and Morlocks in books read at school); that clue about the stargazer had to be the one with the clash; AOR?. It made sense to begin our MAP there as that would nicely fill the grid. 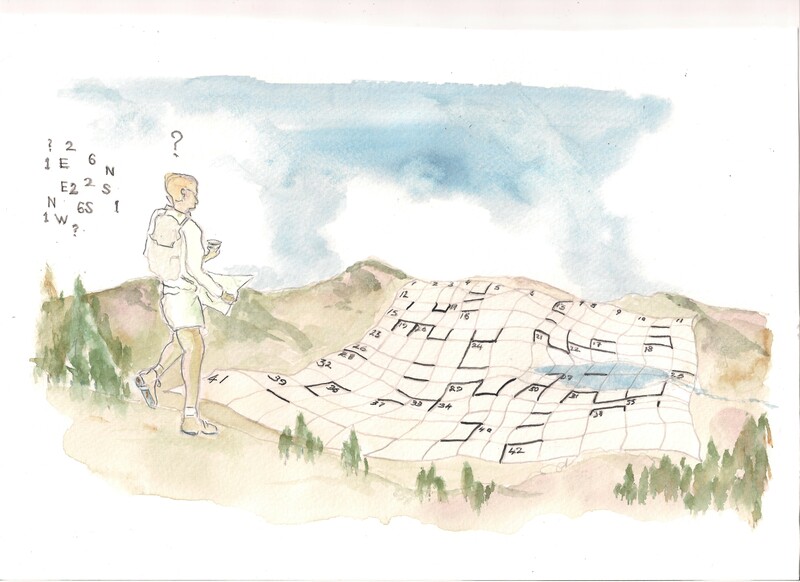 It was some time later that we realized that each time the word turned a corner it passed through one of the letters of ORIENTEERING (and, of course, gave us the astronomer OORT of Oort cloud fame). That resolved any ambiguity about where to stand the feet of the capital A. How very elegant, Samuel! Many thanks. Of course, in retrospect, it is clear how the letters of extra words in down clues were ‘thematically’ used to spell out two instructions. We were lucky in that our initial guess that we were using the ‘sides’ of the words was going to spell out something and we had only solved half a dozen of the down clues when we were able to extrapolate ‘ERASE SOME LETTERS FROM GRID/ REORDER TO SINGLE WORDS’ as the two instructions that told us what to do with the final grid and how to handle extra phrases that were to appear in six across clues. But I am leaping ahead. Naturally, as if I needed to, I scanned the clues to confirm that Ifor has the right to retain his membership of the Listener Setters’ alcohol_lovers.org and, of course he reassured us that ‘Clubs rarely alarm drinking parties (7)’ giving us C + AROUSE, and ‘Weaker, not with redistilled spirit (5)’ (w)EAKER* leading to RAKEE. Indeed, Ifor was in the spirit with that lovely original anagram indicator ‘redistilled’. Nice! These clues were generous for Ifor; we were expecting a far more gruelling solve, and when we broke off for dinner, we had a full grid with a few fairly surprising words in it, PIECEN, ASUDDEN, SWEIRT, ABORE, and a number of likely phrases that we had to ‘reorder to single words’. Yes, ‘a number’, in fact eight! But there were supposed to be only six. Head scratching! We had ‘to start with’ in 9 across, and that doesn’t reorder or anagram into anything very useful and we were convinced that there had to be something in the IONA clue as we simply couldn’t parse it (but we can now – what a delightful clue, ‘More than one railway separately stopped from leading across island (4)’ Of course, the leading ‘across’ clue solution gave DIVERSIONARY, from which we had to ‘stop’ or remove DIVERS and RY, leaving IONA. However, ‘abject Sun‘ was rather obvious and obligingly gave ‘subjacent’ as an anagram, so we were at last on the right track. 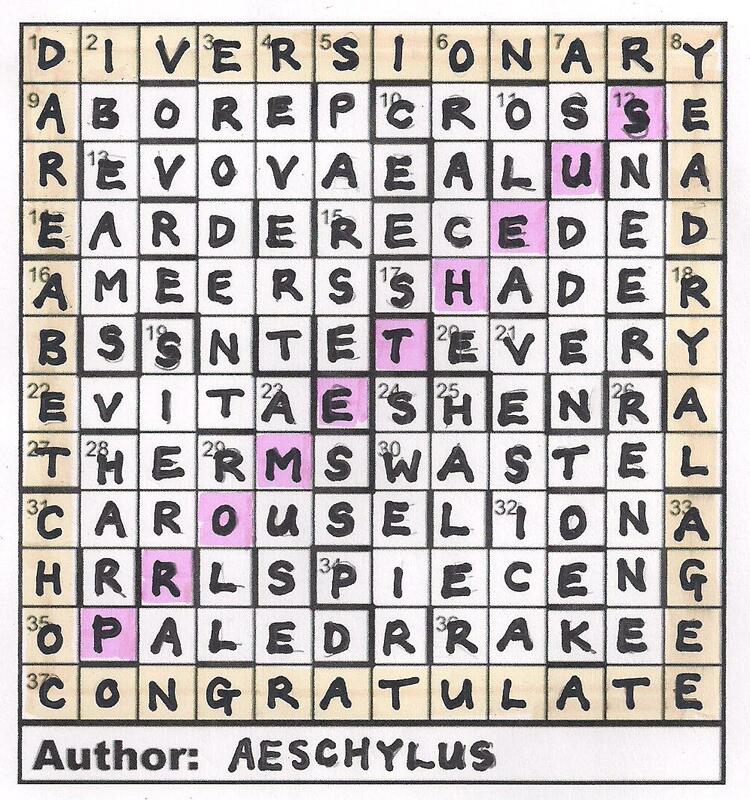 We were rather surprised when ‘can be just’, in 17 across, gave the same anagram solution, and even more surprised when ‘late par’ and ‘pearl at’ both resolved themselves to ‘apteral’ and ‘casual hope’ and ‘has a couple’ both gave ‘acephalous’. Chambers told us that these words meant ‘wingless’, ‘underlying’ and ‘headless’ and we knew from the preamble that ‘the results of this treatment suggest how the final grid differs from the initially-filled grid’. Quandary! Each instruction appeared twice, so were we to remove the top, sides and bottom of the grid twice over? Thankfully, Ifor had used that familiar diagonal (OK – one step up on the conventional – he used the non-leading diagonal in reverse, just to make it a mite trickier) and there was PROMETHEUS, confirming that we had to do the unbinding just once. Oh dear, surely not! I remember Shelley’s ‘Prometheus Unbounded’, a work I simply couldn’t get my head round many years ago, and seem to remember that Milton dabbled in Promethean literature too. We needed Google and it was a relief to find that only AESCHYLUS actually compiled works on both the Bounded and Unbounded Prometheus (or ‘traditionally’ is claimed to have done so – and what a delightful title ‘Fast and Loose’! Obviously AESCHYLUS was required below the grid. At least, I hope so. Many thanks to Ifor. This was fair and fun. So it is that Shirley lets me know that this week she has her setters’ hat on as Chalicea makes her third appearance in the Listener series. I guest-blogged the first, way back in 2013 and all about Anmer, the famous horse who struggled to win a race that one time because some woman got in the way apparently; and last year saw her produce a map of France. That one held me up rather, with the grid being a Carte Blanche, not rectangular and a sneaky little single-cell at the top that held me up for a while. And of course she’s a regular in the EV and Magpie series as well, so I’ve run into her puzzles fairly often. Generally not too difficult but with some fun packed into the grid as an expected but always welcome reward. Oh, and I’ve had such a tiring week (first time for everything!) that I was half-hoping for a Listener that wouldn’t keep me too occupied. So, on with the puzzle! After an almost 8.00p.m. finish at the office my attempts on Friday to get going didn’t really go too far. Indeed, for a while I was staring at clues and making very little out of them. Or, at any rate, not being able to work out the answer to reasonably obvious wordplays. Clearly anagrams at 30ac and 41ac, for example, but ALBUMEN didn’t find its way into the grid until Saturday, and DON’T SAY was about the last entry I fit into the grid (maybe last but one). Also I figured that 45 was probably a hidden word but “hérissé” I’ve not heard of before so that would have to wait as well. An inauspicious start, anyway, but a start all the same and I didn’t look at for much more than half an hour before calling it an evening. So, roll on Saturday. The Today Programme on the radio, talking about the 100th Anniversary of Gallipoli, and so thoughts turn towards the Great War and other 1915 anniversaries. Including the death of Rupert Brooke just a day or so previously, whose name adorns a list of the dead Fellows of King’s College, Cambridge, in a small room on the south side of the chapel. His involvement in Gallipoli was not extensive, dying of malaria before even arriving. Perhaps he was the lucky one, and he is buried famously in an olive grove on the Greek island of Skyros: “some corner of a foreign field that is forever England”, in his own words of that famous poem. An hour later, and a tour through the grid from bottom-left, through to top-right, before finishing in the corner with the tricky-ish DYAD (not D[a]y + ?? but (Day + [e]d)< ), and then it’s off to grab the highlighter to pick out “A RICHER DUST”, along with the more obvious BROOKE running down the middle. All in all you could count 52/169 cells, or just shy of 31% of the grid, as thematically fixed, so another typical Chalicea grid with plenty packed in to a small space. With no Shirley blog this week, I suppose it’s up to me to check whether Chalicea has “confirmed her membership of the Listener setters’ oenophile club”. Apparently not, and if anything she’s trying to stop all this drinking nonsense! 4dn “Limit supply of alcoholic drink in desert”; and 31ac “Taproom, before noon, providing no sustenance”. Take note, future setters, as oenophiles will be frowned upon! Epilogue: A glance back through past war-themed Listeners reveals that I’d predicted this theme about ten months ago. Is this a record for the earliest PDM for a Listener puzzle… ?